I’m a full subscriber to The Age ($46 a month – bargain) and get the print edition delivered every morning, which I read during breakfast. I thoroughly enjoy it, even though the lack of editing and the resulting errors that make it into print drive me to distraction at times. What I like the most is the order that print newspapers bring to the news. First, the stories are divided into sections by type of news – general, sports, business, international, features, letters, opinion, arts and so on. You can open the newspaper to a double-page spread and have a selection of material to choose from. Second, each page or spread has a hierarchy to it, from most important story to least important (in the judgement of the news editor). The hierarchy is distinguished by the placement, size and blackness or thickness of the stories’ headings. Reading just the headings makes it easy to decide which stories I am interested in reading further. Third, there are colour photos, graphics and breakout boxes to make the reading more visually interesting and informative. It’s easy to read because the column widths are short, so the eye only has to travel a short distance. It’s also easy to see how the columns of text flow and where the story ends. There are varying lengths of ‘read’, from a paragraph to a page (or two). Fourth, the advertising is neatly presented in varying sized blocks at the bottom of the pages, with the occasional full page advert. They, too, use the same principles to attract my eye. Fifth, newspapers such as The Age have a spread of news from across the state, country and world. It’s a generalist, rather than a specialist, so you can find out the main stories across a host of fields. I like that; it’s a well-rounded daily education. Sixth, flicking newspaper pages is fast. You can go through quickly until you find something you want to read. The printed page is more comfortable for the eyes to read. I check The Age website a few times each day to see if anything big is happening in the world. The website is OK and has improved a lot since its relaunch in February 2018, when the editorial leaders finally decided to stick to being a serious news site and removed all the awful ‘click-bait’ stories and presentation. The Age has done pretty well in transferring most of the points I made above into its website edition (except for loading speed and the accursed, intrusive advertising). I often click on stories whose headings take my interest. (I just checked the live footy scores as I was writing this – GWS beat Richmond by two points, dammit! Interstate hoodoo continues.) There is a lot more on the website than The Age can fit in its print edition. Stories can be presented for longer on the website; a print newspaper lasts for a single day. The website can archive stories, making them accessible for as long as The Age has room on its servers. That’s a big bonus. I’ve also seen errors made in the print edition corrected in the website edition – another bonus of digital publishing. There are definitely a lot of pluses for the reader in having the newspaper online. I can see that and take advantage of it. But I still prefer my print edition for the ease and pleasure it brings to my reading and I’m going to miss it when it’s gone. The Age newspaper is published daily in Melbourne, Australia. It has been published since 1854, for the vast majority of that time as a broadsheet. In 2013 it switched to full tabloid format. The Sun (morning tabloid) and The Herald (evening broadsheet) were merged in 1990 into The Herald Sun, a morning tabloid published daily in Melbourne, Australia. The merger preserved The Herald name, a venerable newspaper first published in 1840 as the Port Phillip Herald. The Sun News Pictorial was first published in 1922. 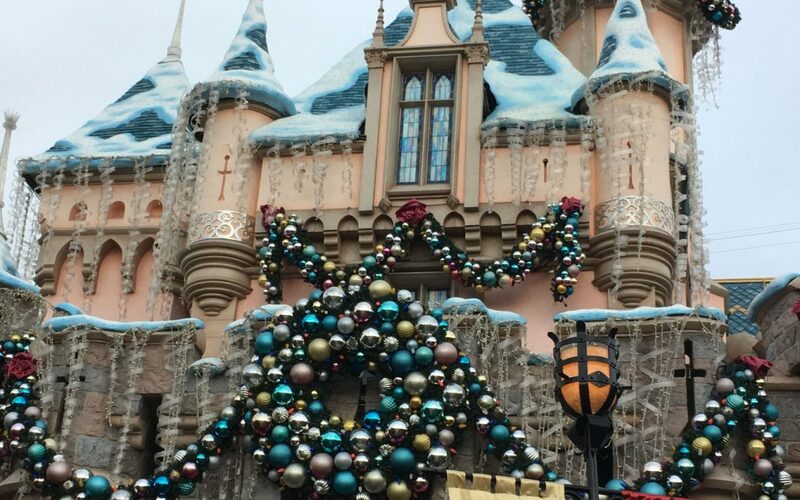 Photo: Sleeping Beauty Castle, with Christmas decorations, Disneyland Park, California.